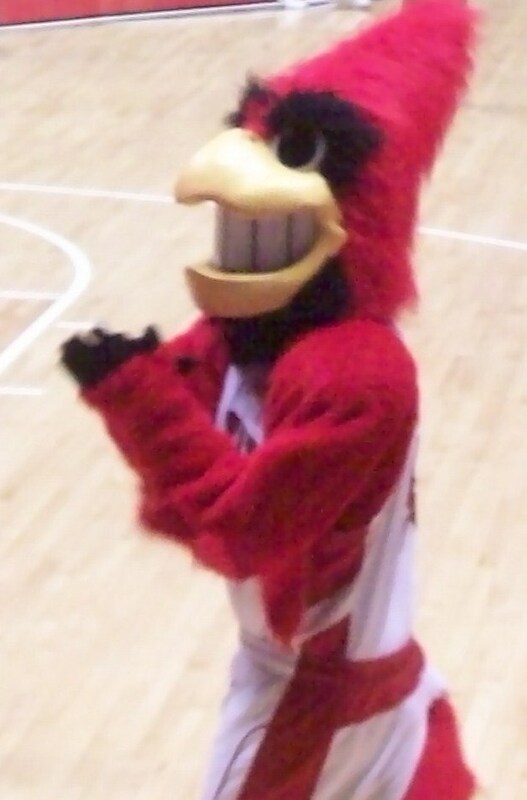 Ball State basketball 2011-12. Serving humble pie to Cardinals fans twice a week. The train wreck known as the Ball State men’s basketball team may be the most depressing feeling I have had as a Cardinals fan and the lessons from the debacle can be applied to every sport on campus, including football. Excuses for the Cardinals poor season (13-14, 4-10 MAC) have ranged from lack of talent to the death of a sibling of one of the players. After summarizing some sources, Ball State basketball has been hit with a problem commonly found in struggling teams. Ball State basketball is beating Ball State basketball in a way no other MAC team can do. 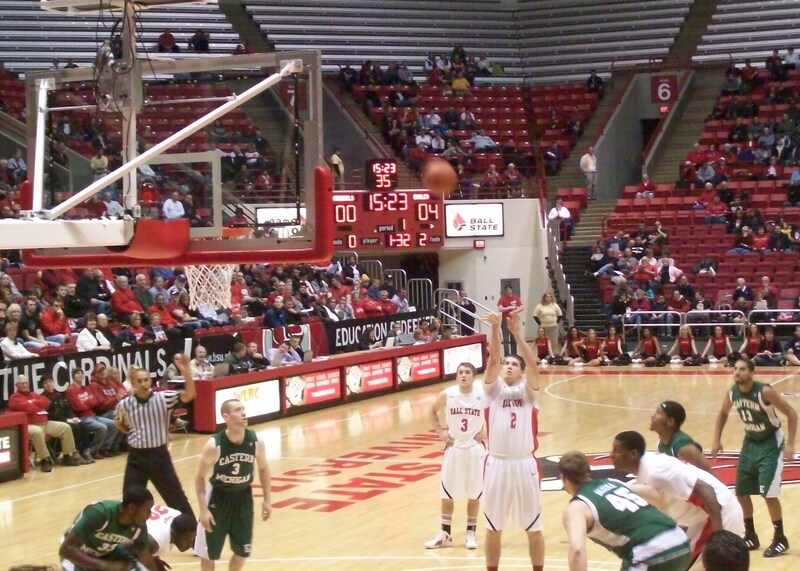 The collapse Ball State is having did not start in 2012. This one started six years ago in 2006. The Cardinals have been through a lot ever since athletic director Tom Collins relieved Coach Tim Buckley of his coaching duties in the spring of 06. I strongly believe that this was Collins worst decision while as boss. Hiring Stan Parrish was at least understandable at the time. Booting a good coach in Buckley, when his best players were injured the whole season appeared to be a power move as Collins was trying to assert control. Hiring Ronny Thompson made sense at the time as Ball State wanted a guy with name recognition. Thompson provided excitement but that turned out to be the only positive. I was fortunate to take a class taught by someone close to the program who explained in detail the horrors of Thompson’s one year reign. The discussion of the Thompson era made my jaw drop for an hour. I guess 95 percent of current Ball State students do not know the scandal even existed or of its magnitude. They just know Ball State struggled at basketball the next several years. Every time I explained why Ball State basketball was in rebuilding mode to a classmate he or she suddenly has a new appreciation for the program. Why has the marketing department not figured this out all ready? Billy Taylor came on board in the late summer of 2007 with 6’4” as the tallest height on the team. Taylor was able to recruit a heck of class in 2008 with forward Jarrod Jones and guard Randy Davis. Taylor repaired Ball State to respectability and added more key players like Muncie native Jauwan Scaife. Ball State won 19 games in the 2010-11 season and looked poised to make a run at the MAC Championship returning all but one player. The Cardinals had battled through the rebuilding process and had developed good chemistry. Ball State was so confident in their team going into this season it rejected postseason tournament offers in 2011 to save money for an exhibition trip to Canada in the summer. It was a move that few questioned a year ago, but now appears to be idiotic. Ball State began MAC play 4-1 in 2012 but has lost nine straight and are in danger of having a losing season. So much for winning 20 games. So what happened? Chemistry was destroyed through player rotations that angered some. Upperclassmen, who fought for years trying to build Ball State back up, saw themselves on the bench in favor of freshman and sophomores. For the upperclassman it is a slap in the face. To them, Coach Taylor is playing underclassmen that would have gone elsewhere if the program did not improve thanks to the seniors and juniors. Playing underclassmen over upperclassmen is not a crime but a coach must have a sound reason for it. At schools like Kentucky, where NBA draft picks are recruited every year, it is easier for upperclassmen to understand being benched. Not the case at Ball State. I do not want to identify the upperclassmen who are upset, but anyone who looks at a box score the last several games can figure out who. Exhibit A speaks for itself. Guards Tyrae Robinson, Jesse Berry and forward Tyler Koch, may have more talent but not by a significant enough amount for upperclassmen to understand the merit of starting them. Robinson was academically ineligible for the first semester but saw heavy minutes since his returned around Christmas. His minutes take away from upperclassmen who are not happy about it. They worked hard on the court and the classroom to build Ball State back up only to be benched by a sophomore who has a history of not taking school seriously. The elephant has entered the room. This is not the underclassmen’s fault; it is Taylor’s for the lineup changes. Taylor forgot to dance with the one that brought you as the upperclassmen felt stood up. Once Ball State lost some tough games in the MAC the animosity in the locker room was no longer covered up from the deodorant of winning. At the point Worthen Arena might as well be next to a damaged nuclear reactor because a meltdown is inevitable. Ball State is not a team right now. It is a collection of players who cannot play defense as a cohesive unit and forces up a prayer as the shot clock expires every blasted possession on offense. A lack of chemistry is all it takes for a team to quit once adversity strikes. Hold the phone. We found someone who has not given up all hope in the season. I never thought it would come to this. I love Ball State basketball the same if not more than my love for the Kentucky Wildcats, and that is from a guy who was born in Lexington. My family moved to Indiana before high school where I started watching Ball State on the local channels. Then there are my experiences with the players. I will never forget the time I met Jarrod Jones in the Atrium as he ate chicken nuggets by himself. Never thought a 6’9” guy with NBA aspirations could be so invisible in a public place. I have done class projects with Pierre Sneed and my friend had forward Chris Bond as his gym partner. I have been watching Davis pass the ball to Jones for four years and wanted them to go out like a champ. In January I seriously thought about how feasible it would be for me and some friends to spend part of spring break in Cleveland watching Ball State win the MAC tournament. Instead the seniors who brought Ball State basketball out of the Thompson era will go out with a whimper. Taylor’s coaching job is at the mercy of whoever replaces Collins. Ball State will be lucky to win a game in the MAC tournament as it is clear many of the players just want the season to end. Ball State can have an amazing basketball program. I am tired of everyone kissing up to Butler. Your Cardinals have the resources in place to build a team capable of having deep NCAA tourney runs of its own. Sadly, it will not be anytime soon. Turning to football, I believe Coach Pete Lembo understands the chemistry side of a team as he is big on redshirting freshman. This makes sure upperclassman get nod unless an amazing newcomer joins the squad. An example Cardinals fans know was senior quarterback Joey Lynch stepping aside for some freshman named Nate Davis. Lynch understood the reasoning behind Davis getting the start. Quarterback Kelly Page stepping down for Keith Wenning is a more recent example. Several Ball State basketball players did not understand the reason for their lack of playing time in 2012 destroying chemistry. The result is implosion in Worthen Arena that is hard to watch. Well… the Indiana Pacers are looking good.